It's wrong, I know, but I play out this dance with him, exquisite and slow. I play it out in my head, because that is the only place it will ever happen. We follow our scripts like actors in a very large, very long production. And even with no audience, none of us gives a hint that it isn't real. He is the drip, drip of water that carves a canyon right through the middle of me. ** This is actually somewhere between 4.5 and 5 stars, but since I really (and I mean REALLY) enjoyed reading it, I am going to go with 5. This was my first book by Ann Brashares and I really loved it. For whatever reason, I never got around to picking up any of her Sisterhood novels, even though they always sounded fun and exciting to me. I'm glad I didn't make the same mistake with her latest literary endeavor. 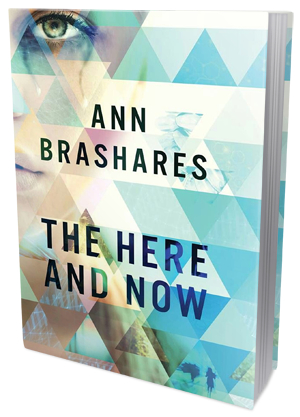 The Here and Now is a gorgeously written, smart and moving Science Fiction novel about time travel, forbidden love, difficult choices, sacrifices and second chances. I love Sci Fi books, especially when they revolve around the subject of time travel and paradoxes. I particularly adore books that are intellectually stimulating and seamlessly plotted, with unpredictable twists and surprising reveals. And if they pull on my heartstrings and make me wonder about certain things in my own life (love, friendship, family bonds, destiny, etc..) - even better! The Here and Now did all that for me and I guess it's safe to say that I loved everything about it. Ann Brashares writing style is simply beautiful and breathtaking. She has a fantastic way with words. She draws you in and keeps you there, and before you even realize it, you're completely lost in the story. Her style is evocative, insightful and honest. The book is filled with thoughts and passages that just beg to be highlighted and quoted. It's not just some cheesy Sci Fi flick, it's a truly thoughtful and meaningful story that just happens to have a fascinating time travel premise. Our heroine, Prenna, immigrated to 2010 New York from a distant future. A future where the world as we know it no longer exists. It's been destroyed by our own selfishness and ignorance. A deadly blood pandemic killed millions, leaving the survivors to live in constant fear of getting infected. No time to come up with a solution. No way to fix things. Together with a group of survivors, Prenna travels back in time and starts a new life in New York, where she is safe from the pandemic, but far from being free. There are strict rules she and other time-travellers have to follow. She has to do her best to blend in, she can't draw attention to herself, she is not allowed to talk about the future or her life before the time travel, and - most importantly - she can't get intimate with any of the time-natives. While not very happy about it, Prenna manages to follow all these rules. At least until one day a short conversation with a certain homeless guy flips her entire life completely insight out. I really liked both Prenna and her time-native friend, Ethan. Their relationship was obviously very complicated - and by complicated I mean strictly forbidden, possibly life-threatening to one or even both of them. They were so perfect together. The chemistry between them was both sweet and spine-tingling. And yet their love story was a tragic one. A real forbidden and impossible love, not some fake, "it-all-magically-works-out-in-the-end" one. A truly heartbreaking story that kept me glued to the pages all the way through. The character development was very good. I especially enjoyed learning about Prenna, her experiences, thoughts and feelings. Coming from year 2098, she had a hard time adjusting to the new reality and I really loved reading about her reactions to certain things - things that we would normally take for granted, like clothes, fully-stocked stores or cookies. And I thought the letters to her deceased brother, in which she'd talk about the world in 2010 and all the things that amazed her, were a great addition to the story. At 288 pages, The Here and Now makes for a quick and very entertaining read. But, even though it's not very long, it's certainly a well thought-out and satisfying read. A book full of surprises, brilliant thoughts and truly heartbreaking moments. I can't wait to read more of Ann Brashares works!